Feeling a bit smug. I have FINALLY got some PSB and eaten it too! Went up in the scorching heat, luckily armed with sunhat and sunblock (and insect repellant) and put in my spuds. 27 Charlottes, thankyouverymuch, planted with handsful of comfrey leaves. 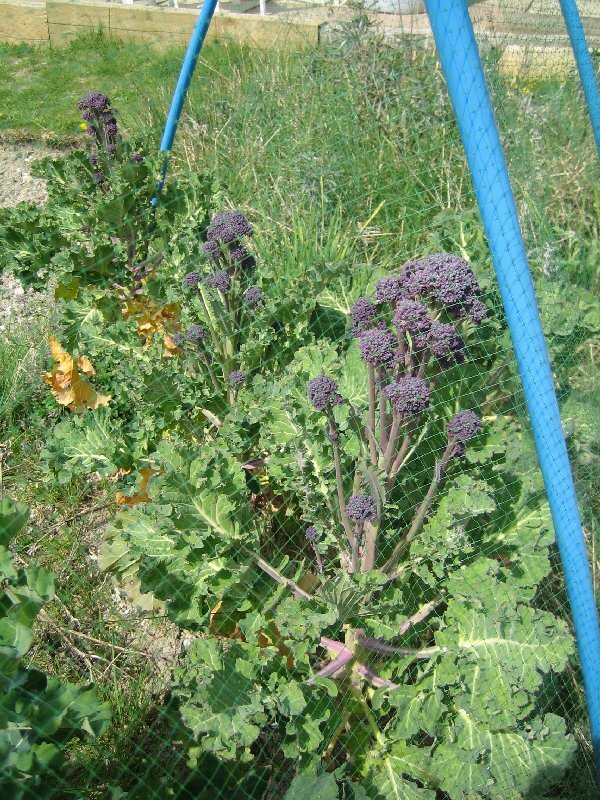 But I have PSB - and what a gorgeous colour it is! Cut three plants (the other three don't seem to be flowering, hope that's a yet) and hope that I get some more sideshoots. Also pulled a few rhubarb stems and they were really tender - so a rhubarb and ginger crumble became destined to be part of tomorrow´s lunch. I also made a ginormous apple crumble, expecting the boys to eat that one. Astonishingly, my struggling Stella Cherry has turned itself almost into a minarette shape. And is flowering like mad. One can but hope... 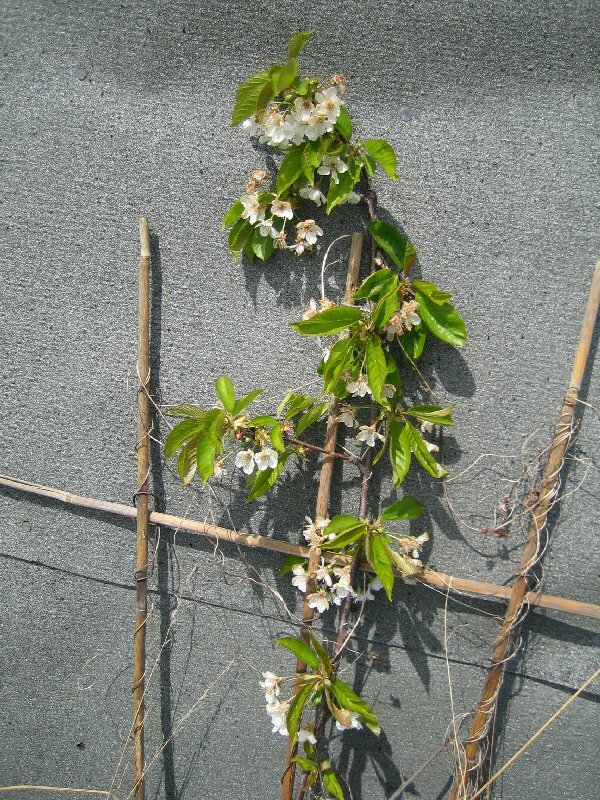 The vandalised Victoria Plum (which *was* a minarette) is also flowering like mad. From about a couple of feet high, swamped by the weeds. Went up again today, armed with a large bag of compost/JI and topped up my 1m square raised carrot bed. It's now planted with four rows of Nantes and Autumn King, and enviromeshed within an inch of its life! Also cheated and bought a huge punnet of leek Musselburgh seedlings, and two punnets of white cabbages (Minicole and Primo). The surviving Red Jewels are still growing (just) despite being fried in the last couple of week's heat. They're in the potting shed now, ready to go out when I next manage to get up. Had great fun at home when I got back, potting on the cabbage modules (which were rather tiny). Small boy loved helping fill the pots with compost and wanted to put the cabbages in, too! Then we did a few chillies and they were very large pots - so he spent ages shovelling compost with a smaller pot. :-) I also showed him what all the seedlings were going to turn into, thanks to having examples of all in the fridge. Somehow managed to find time to go up with the first batch of cabbages. Decided that the Primo could go in first as they are the larger cabbages and will probably need more time, but then got a bit of a shock when I tried to dig a hole for the first one. The bed was more full of couch bootlaces than I´d expected - talk about regrowth! Hacked away at them with a trowel for a while then gave up and asked Loraine (who was working on the Focal Point) if she could lend me her fork for a few minutes. More like half an hour... but there are a lot fewer couch bootlaces in the bed, and the first eight cabbages are hiding under their enviromesh. They had already grown roots to fill the pots I´d put them in last weekend. Picked a few more broccoli spears, and Chris donated some rhubarb to save me trying to get to my own in the undergrowth. That should make small boy happy. Had a chat to her while trying to weed the parsnips a bit more. 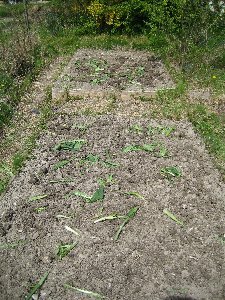 I think I´ve just about got the actual rows of seedlings free of the pot marigolds now. Still dozens of marigolds though. Went home and sowed beans, marrows, butternuts and lettuces with small boy. Well the weather might be clement enough to let them germinate in the shed, though I suspect they won´t be warm enough. Can´t put them in the heated prop as it´s currently full of chillies and I´ve nowhere else to put them since the conservatory is full of toy cars and diggers. When I´m back it´ll be easier. 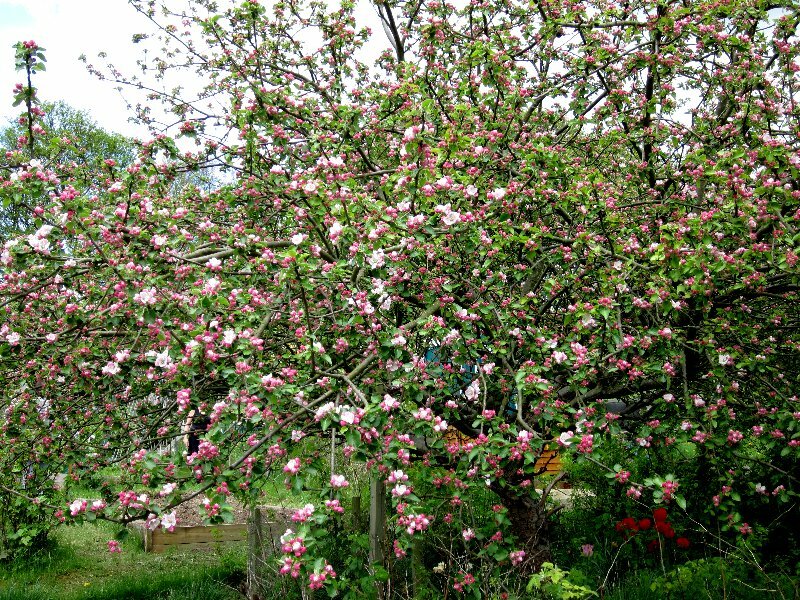 Bramley, getting ready for a monster flowering. Curses. 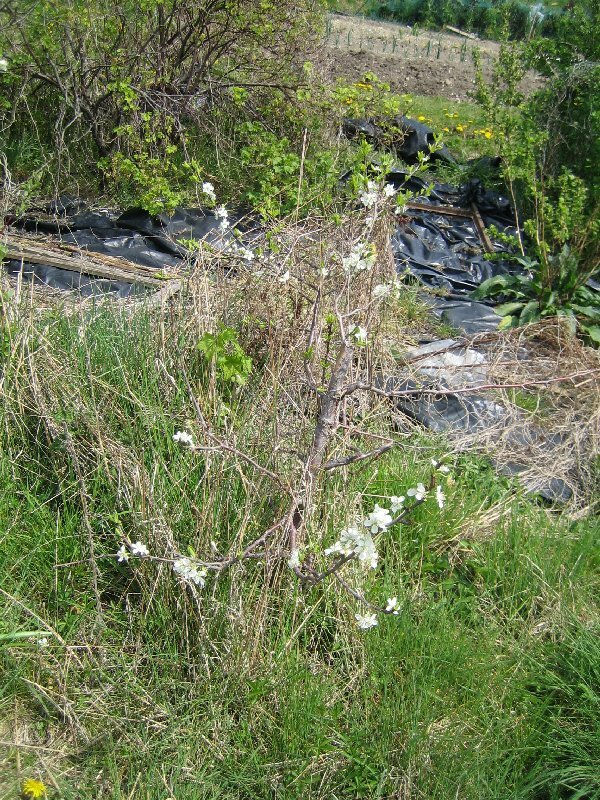 This last week´s frosts have destroyed most of the burgeoning cherry crop. Wail. There were loads on, too! Now just so many little blackened spheres. Luckily most of the stuff at home has survived thanks to the shed; it did drop below freezing one night (at least at the level the thermometer is suspended). One butternut (Avalon) is up, astonishingly. I have bought half a dozen Gardener´s Delight tomatoes and two Golden Sunrise from various plant sales, ditto 12 purple sprouting broccoli plants, and a punnet of something which may be bedding dahlias but wasn´t labelled! Meanwhile I carted up the next lot of cabbages, this time the minicoles. Also took the forks! 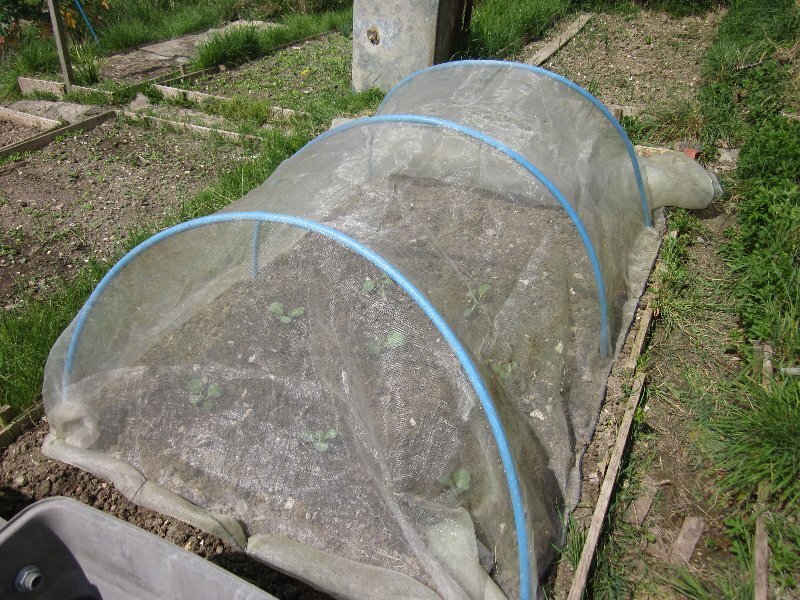 Spent a while digging couch and bindweed out, then planted the cabbages, watered them in and extended the enviromesh cosy to cover them all. Now have 16 cabbages in place, all the summer ones. Next time: the reds. The parsnips are doing very well now, despite the stupid numbers of weeds. Not only are there hundreds of pot marigolds, there are now hundreds of poppies too. They look like opium poppies - which are gorgeous, but there are way too many! But given my love of poppyseed bread, I aim to leave in a fair few if they aren´t in the way. Lots of folk up there were complaining about the loss of things in the frost. Potatoes have been badly hit; I am now quite glad that mine went in late and so far haven´t emerged! 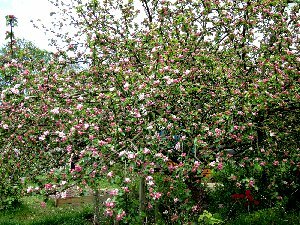 The apple trees also seem to have managed; there are some browned flowers on the Bramley but still a lot which are just opening so are safe. And if some fall off - well, that will do me a favour! This week Gardening Lady has finished off the last big bed on Plot 2´s main part. There is one small bed left, then it´s the big job of the one by the shed which is pretty much as bad as it was when I first cleared it and probably won´t be done for a while. GL calls it the evil bed and I don´t blame her! I guess there´s also the long bed on the plot border, but that´s earmarked for raspberries and won´t need digging until the autumn. On a more positive note, much to my joy, the carrots are up. And how. 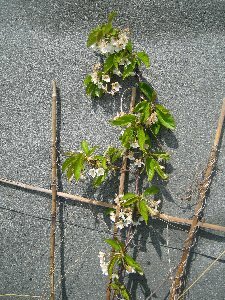 Four rows of little leaves. That will do nicely. I just have to try and remember which ones are which! Took home some huge rhubarb stems. I take back what I said about my patch. If I leave it long enough, they do well. Just not earlies. That got turned into another rhubarb and ginger crumble in time for supper. Day off, purportedly to get allotment weeded and spend the day up there. As usual, things went pear-shaped early on. First, friend dropped in to pick up small boy´s cot (they´d loaned it to us in the first place) which ate an hour, then phonecall to say the double glazing people could come this afternoon to fix the panel I managed to flirt a stone through with the strimmer. So the afternoon went bang. Finally got to allotment at about 11.45, by which time it was astonishingly hot. Wish I´d got up first thing! Put the red cabbages in; they ended up in the bed I´d thought about putting leeks in, because the one they were supposed to be in in full of couch and would have taken me a while to dig over. 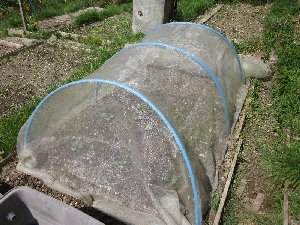 However, once I´d managed to parcel up the seedlings in their mesh tent, I decided to get rid of the few bits of white bindweed I could see appearing in the old salsify bed (and the salsify, too). Of course this turned out to be a rather larger job; the bindweed nests were huge and I ended up digging *that* one over. Now looks weed-free, though does need raking to flatten it. I´d taken the long Wolf handle up to hoe the onions but didn´t take the rake head. Next time! Hoed between the shallots and the onions. Not as many shallots came up as I´d planted (odd) but there are a respectable number for all that. Parsnips still doing very well, and the carrots too. I´ve racked my brains and I can´t remember which carrots are sown on which side. Bah! Well they have been in a month, almost, so time to sow some more (once this heatwave has vanished and we´re back to good old British weather). 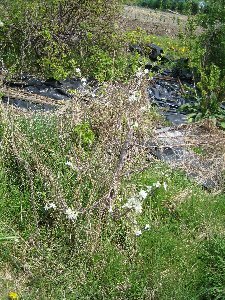 Was rather disappointed to note that the greengage and plum have also lost all of their fruitlets in the frost. Finally went home at 1.45pm: two hours managed, which was disappointing but all the same, it was so hot it´s probably as well. At home, carried on gardening while the window man fixed the conservatory. 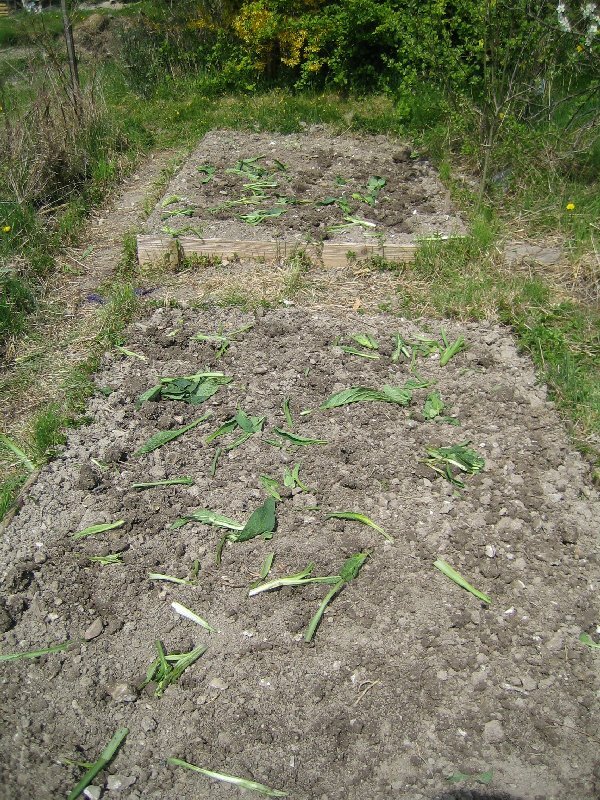 Now have sowed four courgette `Defender´ and four courgette `Atena´. The latter are yellow: I do like having a mix! The previously-sown cucurbits, which I´d thought wouldn´t do anything in the cold of the first week of May, are all up now. That´s four butternut `Barbara´, four butternut `Avalon´ and six trailing marrows. I´m amazed. More sowing. Have now sowed 15 runner beans `Enorma´, 30 more French beans (this time Safari, hoping they won´t rot like the last lot) and all my remaining packs of Sweetcorn `Lark´ even though none of those are very recent. If I haven´t seen any in a couple of weeks then I´ll get more. Potted on the cucumber, and the tomatoes `Golden Sunrise´ and `Gardeners´ Delight´, though the latter are in smaller pots than they need to be. They´ll all be vying for space with the chillies in the potting shed, which is currently full of the pots of seed and seedlings. I hope that the forecast of frost for next week is incorrect or I look like putting the paraffin heater on! Annoyingly, I also found the missing packets of courgettes from last year. Oh well! Heatwave hit 30oC today. Phew. Escaped at 8pm and plied the seedlings with water for half an hour. Quite like the old times, going up to water of an evening. The hoeing has worked very well; the onion and shallot plots look a lot better. Gardening Lady has finished off the small bed in the middle of Plot 2, so there is only really remedial work to be done until the next nightmare bed needs doing. Right now, I´m not going to bother with the edge-of-orchard beds or the one by the shed; I now have enough room for all the plants I´ve got planned, and I´m sure GL has other folk´s gardens to sort out bedding plants for at this time of year. 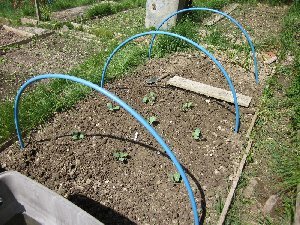 I must sow modules of beetroot though; the direct-sown ones aren´t doing terribly well, probably thanks to being mugged by the poppies (most hoed off now). The parsnips are galloping. And I have a spud through! Germination update: All eight courgettes have germinated, some of the French beans are poking through. The bigger tomatoes are flowering. Hopefully the runners and corn will appear before the end of the Bank Holiday. Quite glad that the weather has cooled back off - the seedlings looked like they might fry in the temperatures at the start of the week.